We’d love your help. Let us know what’s wrong with this preview of The Submerged Sea by J.S. Watts. A poetry pamphlet by the UK poet J.S.Watts. The Earth is the only known planet with seas of liquid water across its surface. It contains more water than land (approximately 71% of the planet is covered in water). Britain is an island surrounded by sea. There is every chance that humanity’s primitive ancestors first crawled out of the sea to become land dwellers. Over half o A poetry pamphlet by the UK poet J.S.Watts. To ask other readers questions about The Submerged Sea, please sign up. I read and then re-read The Submerged Sea, usually the last thing before bed after putting down my other books. Two big positives for me...the theme of the sea and the author's obvious love and respect for it. I tend to view what I read through the lens of past experiences and I like poetry and prose that brings back memories or emotions. The poem Gull, was one of several favorites in this book because it immediately brought back memories of my childhood trips to Ft. Meyers beach in Florida with I read and then re-read The Submerged Sea, usually the last thing before bed after putting down my other books. Two big positives for me...the theme of the sea and the author's obvious love and respect for it. The poem Gull, was one of several favorites in this book because it immediately brought back memories of my childhood trips to Ft. Meyers beach in Florida with my mother and stepfather. At the age of 10, and being from the northern tier of states, my first time seeing seagulls was pretty fascinating for me and despite being a bit raucous when they are competing for pieces of bread on the shore, I still find them to be majestic flyers and true symbols of the ocean and the shoreline. But as it matters to the moon. And finally, Scattering, which reminded me of the brief graveside memorial we siblings had for my mother in 2013.
on the green wave-roll of the earth. We buried my mother's ashes next to my stepfather who had passed away much earlier than she. My stepfather crewed on a sailboat on Lake Michigan with a friend of his...it had become a bit of a passion, to the point where they would annually race the Chicago to Mackinaw. When he became ill with cancer and eventually passed away it had been my mother's wish to scatter his ashes on Lake Michigan but because of the religious convictions of his family, my mother settled for a traditional burial. If my mother had been able to get her wish, both would have had their ashes scattered on the shoreline. 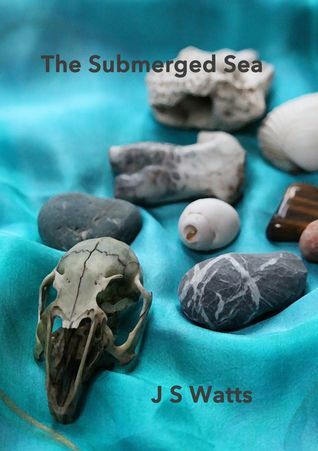 I am, perhaps, oversharing, but for me, The Submerged Sea is a sublime little collection of poetry and I will go back now and then to dip my toes into it's waters. The synopsis of J. S. Watts' The Submerged Sea perfectly surmises its ongoing motif. It is a collection of poems that revolve around the essence of water, within humanity and on earth. The poems are filled with lush descriptions of seascapes, and I found myself being reminded of the Romantic poets who sought their solitude in nature and found enlightenment there. The imagery is very evocative and the reader is transported to each new scene the poet creates. Among my Vivid, Descriptive, Evocative. Watts' collection is for taking to the ocean, away from crowds and the human trappings of boardwalks and tram-cars. It is for sitting by grey oceans, watching the tide come in, and appreciating the beauty that it to be found in simplicity. There are also shipwrecks submerged in the sea. Sometimes it is not just the grass that waves; the land itself seems to move in response to the sea. Watts uses refrains and other musical language to convey her fresh vision of all this motion. In “The Flotilla of Lost Words,” which addresses the moon as muse, she describes her words as “floating away/on little paper boats.” Fellow poets will relate to the humor and frustration expressed in that poem. The Submerged Sea is a small but satisfying collection of words that didn’t get away.